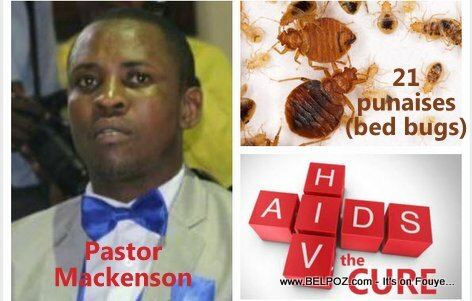 Mackenson Dorilas, the self proclaimed prophet in Haiti who recommended 21 bed bugs as treatment for AIDS was sanctioned by the Ministry of Cults Tuesday Sept 21 2018. Not a word to the media, church or social media for 30 days, authorities said. The ministry of Cults has forbidding Prophet Mackenson to evangelize on the national territory until he provides the legal documents attesting to his competence to act as pastor. "But I am not a pastor!" Dorilas said, "I am a prophet," and there are no written rules or requirements for prophets in Haiti. For an entire month, Prophet Mackenson Dorilas has no right to evangelize, he is not to speak to the media, No internet broadcasts whatsoever, not before he proves by a valid theological degree, his knowledge in the field. I need a miracle to be debts free.